16 selected walks on Isle of Wight highlighted on a map at 1:41,000 from Heritage House, each presented with an informative description. Plus information on access by public transport, including a bus routes map, walker-friendly accommodation, pubs, etc. The map divides the island east/west with a good overlap between the sides. 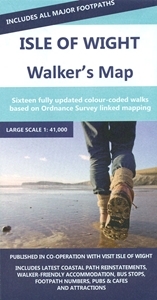 Recommended walks are prominently highlighted in different colours, with various points along them cross-referenced to the description. Current edition published in April 2016 includes latest coastal path reinstatements. 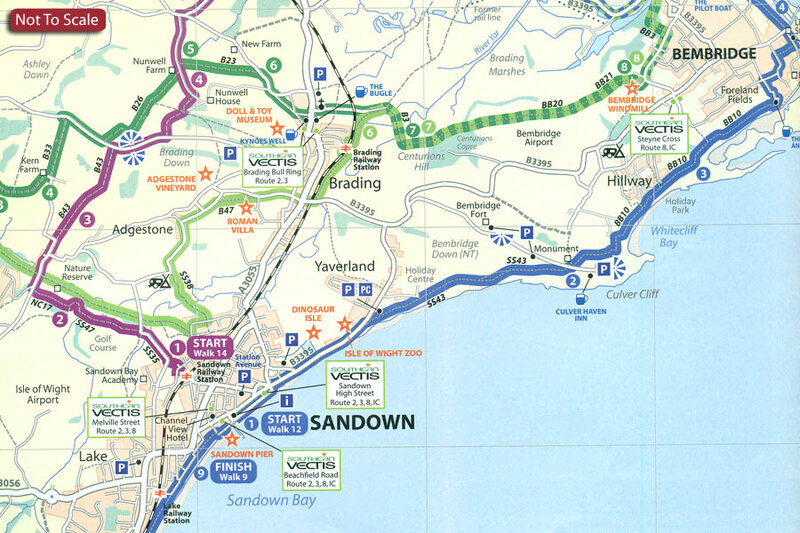 The map indicates access to the walks by Southern Vectis bus services and symbols mark various facilities including caravan/camping sites, recommended walker-friendly accommodation, selected pubs and restaurants, viewpoints, etc. Topography is indicated by colouring for woodlands and names o features like downs. The map has no GPS coordinates. An inset shows the routes of Southern Vectis bus services.